Creating your estate plan is a highly personal and individual process. Given the importance of the finished product, choosing the right estate planning attorney to assist you should be a priority. At the Beverly, Massachusetts law firm of DeBruyckere Law Offices we understand the important role your estate plan will play in protecting you, your assets, and your loved ones. With that in mind, we hope to have the opportunity to assist you in the creation of your comprehensive estate plan. Beverly, Massachusetts boasts a hoard of interesting historical sites and stories. These historic locations and events contribute to the richly unique history of both the city itself, and the United States. The oldest residence still standing in Beverly dates back to 1679, which signifies how deep the city is embedded in American history. Beverly is considered by many to be the birthplace of the American Navy since the very first vessel the U.S. Military ever commissioned was built in, and sailed its maiden voyage from, Glover’s Wharf on Beverly’s shores. The first cotton mill in the U.S. was built in Beverly, and was the largest mill in the country at the time. The building of this cotton mill in Beverly is considered to be the birthplace of the American Industrial Revolution. In the early 1900’s the United Shoe Machinery Corporation built a massive complex of reinforced concrete buildings that occupied roughly a quarter mile stretch of land. These structures, like so many things in Beverly, were some of the first of their kind. The buildings were closed in 1987, reopened in 1996, and today house technology companies and medical offices, as well as offices for Parker Brothers. American President, William Howard Taft, spent four summers vacationing in Beverly at what is now the Italian Garden at Lynch Park, and resulted in Beverly Hills, California being named after the Massachusetts city. As of the 2010 census Beverly has just under 40,000 residents which helps to keep a warm, small-town feeling to the city. Beverly has several elementary schools, one middle school, one high school, two colleges and over a dozen private schools which provide an ample educational opportunity for its residents. Endicott College offers 23 bachelor programs from a wide range of concentrations and the Montserrat College of Art provides education in the visual arts. The world’s longest running magician’s show, Le Grand David Spectacular Magic Company, ran for thirty five years at the Cabot Street Cinema Theatre. Beverly is home to several wonderful parks including Lynch Park, which today is the site of the Italian Rose Garden. The garden was crafted by the Evans family and includes rare flowers and other plants imported from around the world. Beverly has five gorgeous beaches stretching along the North Shore that provide summer recreational fun with sunbathing, swimming, kayaking, and picnic opportunities. While Beverly has a rich historical background and a lively summer life, the town also boasts a stable economy with several major employers, including Axcelis Technologies, Zipcar, Crane Aerospace, Orchard Brands, and even Microsoft that all call Beverly home. Beverly, Massachusetts is a beautiful, dynamic, city with a rich history and a promising future. The attorneys and staff at DeBruyckere Law Offices are proud to be part of the Beverly, Massachusetts community. To us, our clients are more than just clients, they are neighbors and friends in the community we share. With that in mind, we have devoted our law practice to helping our friends and neighbors protect what is important to them through comprehensive and forward-thinking estate planning. Creating your estate plan is not something you do and then forget about. On the contrary, estate planning should be an ongoing process that evolves over time. As you mature and grow personally, so does your estate as do your estate planning needs. The estate plan you create as a young, single person just starting out in a career may focus primarily on protecting you and you’re yet to be made fortune. When you get married and start a family, your estate planning needs will expand to include protecting your young family from the financial hardship your unexpected incapacity or death could cause. Later on, your plan may need to consider components that will help grow and protect your estate, such as asset protection, business succession planning, and tax avoidance. As you near retirement age, we will make sure your estate plan includes Medicaid and retirement planning components to ensure that your golden years are what they should be. You may also want to focus on probate avoidance in your estate plan as well as the inclusion of legacy planning strategies to ensure that your beliefs and values are passed down along with your assets to future generations. Finally, funeral planning may be interjected into your estate plan to provide you with peace of mind knowing your wishes will be honored and your loved ones won’t have to endure added stress while grieving your loss. 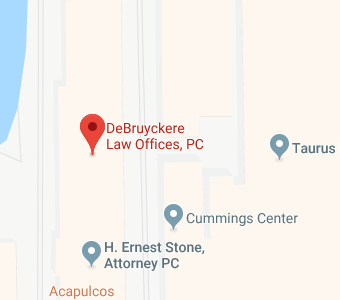 Whatever your estate planning needs are throughout the various stages of your life, the team at DeBruyckere Law Offices will be there to ensure those needs are reflected in your comprehensive estate plan. If you have estate planning questions or concerns, or would like to get started creating your estate plan, contact the experienced Beverly, Massachusetts estate planning attorneys at DeBruyckere Law Offices by calling (978) 969-0331.